Anyway, we've had some up's and down's with the temperature this October (what fall does best), but I've relished the days when it's been chilly enough to rock a turtleneck sweater. This one comes from Velvet by Graham and Spencer, and it's incredibly cozy. 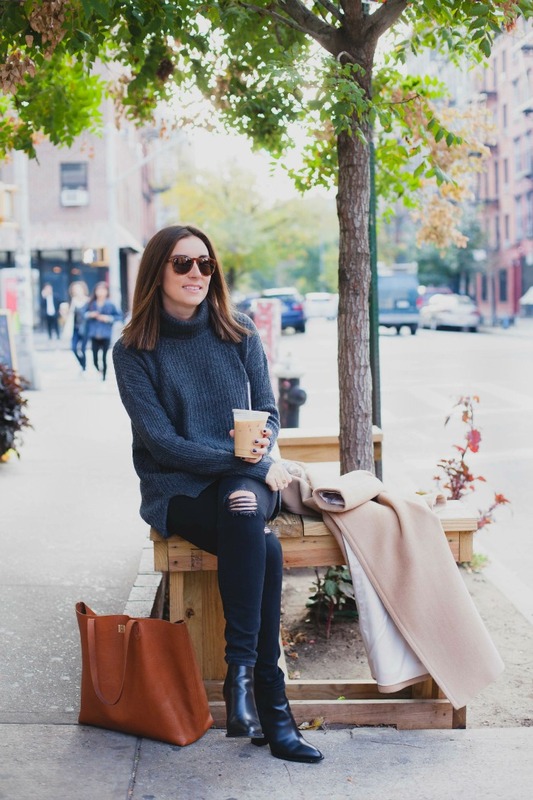 I love the slightly slouchy fit, extra-long sleeves and wear-with-everything grey hue. These jeans are a favorite from Gap last season, and because of their high-waisted, super-skinny fit, I often refer to them as my "denim girdle." They have a similar pair this season (on sale!) if that description is appealing to you, ha! 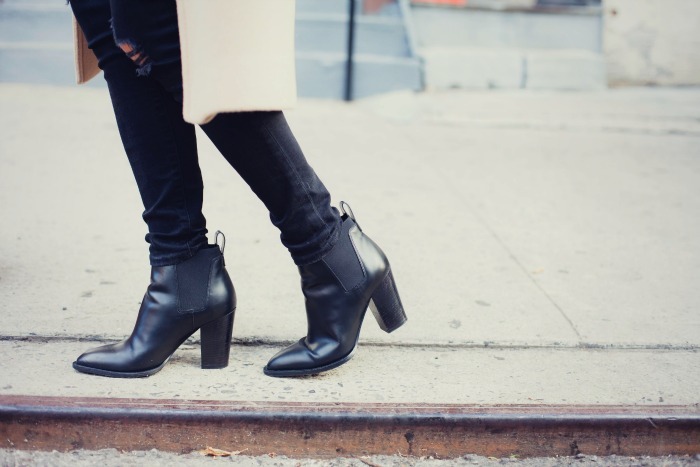 Behold, the perfect fall booties. These Vince bad boys are are an investment, make no mistake. But their perfectly pointy-but-not-too-pointy toe and stacked heel ensure they have timeless appeal. I've been wearing them with everything these days, and don't plan to retire them any time soon. They look great with skinnies, under flare jeans and with dresses, too. All-purpose booties like this are a true treasure, and because I want to wear them with so much, I'm going to make sure I weather-proof them before winter arrives. Ahhhhh, the pièce de résistance—this coat. I mentioned in a couple of past posts how much I've been dreaming of the ideal topcoat to take me through fall and winter in style. The answer came from Club Monaco, in the form of the 'Daylina' coat. I love the dramatically wide lapels and below-the-knee length. 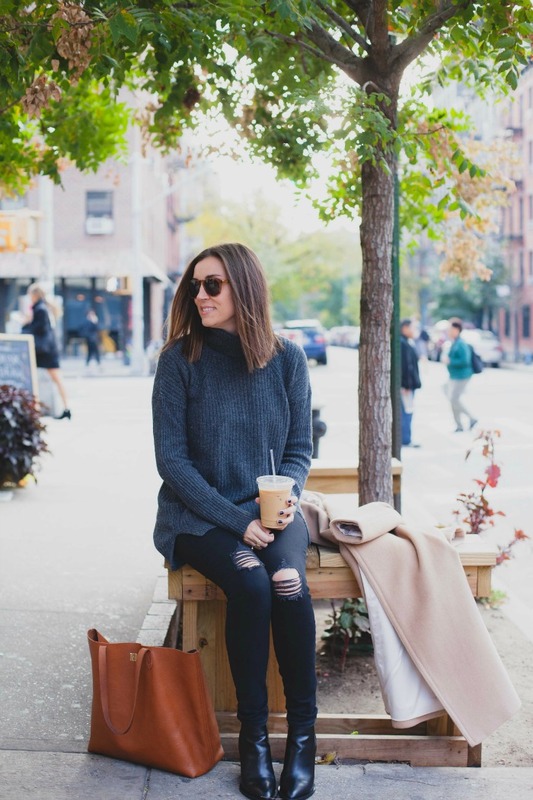 Like the booties, this is a forever piece, one that's worth the investment and sure to last me for chilly seasons to come (it's 80 percent wool), long after we've relegated "Hotline Bling" to our throwback playlists. BEST outfit! Looks so killer on you! Amazing look! I love the coat, such a great statement piece!